Form No. 4.-100 - 17.8.10. Delivery Date 16 APR 1912. No. OLYMPIC, Handed in at VIRGINIAN. To : CAPTAIN OLYMPIC RECVD 8.45 am NYT. 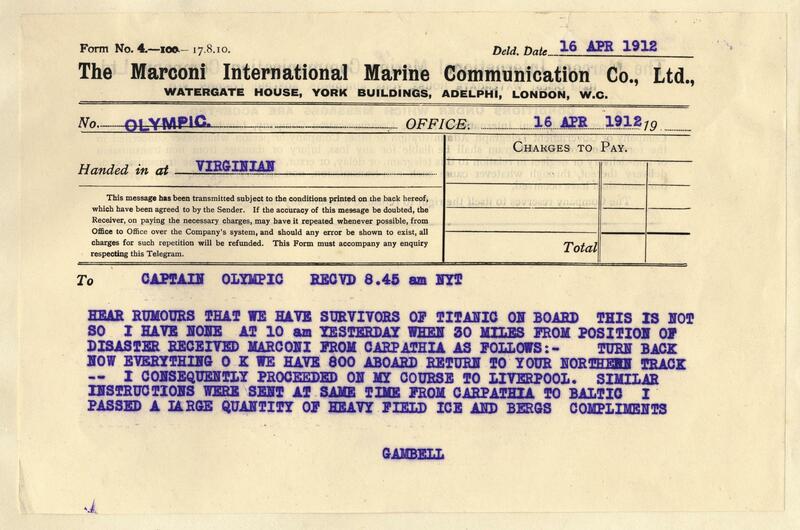 HEAR RUMOURS THAT WE HAVE SURVIVORS OF TITANIC ON BOARD THIS IS NOT SO I HAVE NONE AT 10 am YESTERDAY WHEN 30 MILES FROM POSITION OF DISASTER RECEIVED MARCONI FROM CARPATHIA AS FOLLOWS : - TURN BACK NOW EVERYTHING OK WE HAVE 800 ABOARD RETURN TO YOUR NORTHERN TRACK- - I CONSEQUENTLY PROCEEDED ON MY COURSE TO LIVERPOOL. SIMILAR INSTRUCTIONS WERE SENT AT SAME TIME FROM CARPATHIA TO BALTIC I PASSED A LARGE QUANTITY OF HEAVY FIELD ICE AND BERGS COMPLIMENTS. GAMBLE.